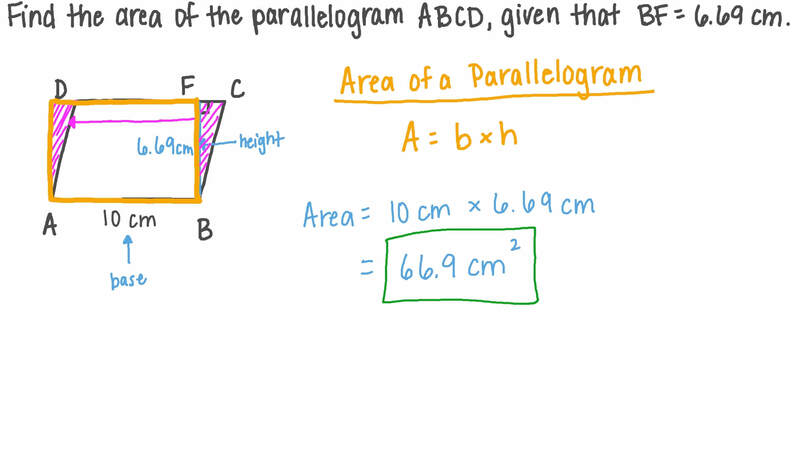 In this lesson, we will learn how to calculate the area of a parallelogram and how to solve word problems requiring the area of parallelogram-shaped figures. Given that 𝐴 𝐵 𝐶 𝐷 is a parallelogram and 𝐸 𝐹 = 6 c m , find its area. Find the area of the parallelogram 𝐴 𝐵 𝐶 𝐷 where 𝐴 𝐵 = 8 . 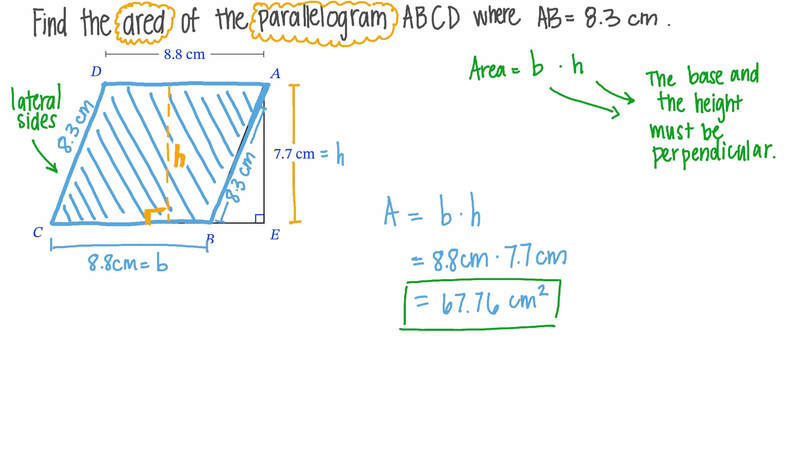 3 c m .
Find the area of a parallelogram having a height of 18 cm and a base length of 12 cm. The given figure shows a parallelogram inside a rectangle. Determine the area inside the rectangle that is not occupied by the parallelogram. The given figure shows one parallelogram inside another. Determine the area of the shaded part. The following figure represents a rectangle inside a parallelogram. What is the area of the coloured region? The table shows the dimensions of parallelograms drawn by three students. Whose parallelogram has the largest area? The figure below represents the design of a rectangular piece of land whose dimensions are 14 m and 9.2 m, where it has three congruent places for parking cars that are in the shape of a parallelogram, two congruent places for planting flowers that are in the shape of a triangle, and a passage for cars that is in the shape of a rectangle whose width is 4.6 m. Determine the total area specified for parking cars and the total area for planting flowers respectively. Find the base length of a parallelogram whose area is 306 cm2 and height is 17 cm. Given that 𝐴 𝐵 𝐶 𝐷 is a parallelogram and 𝐷 𝐸 = 1 3 c m , find the length of 𝐷 𝐹 . The lengths of two adjacent sides in a parallelogram are 20 cm and 25 cm. If its greater height is 23 cm, find its smaller height to the nearest centimetre. Given that the area of the parallelogram 𝑋 𝑌 𝑍 𝐿 is 682 cm2, find the area of △ 𝑀 𝐿 𝑍 . A parallelogram with area 301 has a base of 35. What is its height? Given that the area of the parallelogram 𝑋 𝑌 𝑍 𝐿 = 6 1 0 . 9 c m  , find the length of 𝑋 𝐿 . Find the area of the parallelogram 𝐴 𝐵 𝐶 𝐷 . If 𝐶 𝐵 = 2 3 c m , 𝐴 𝐸 = 1 6 c m , and 𝐴 𝐹 = 2 0 c m , find the area of the parallelogram 𝐶 𝐵 𝐴 𝐷 and then determine the length of 𝐶 𝐷 to the nearest hundredth. Determine the height of a parallelogram whose area is 20 cm2 and base length is 4 cm. 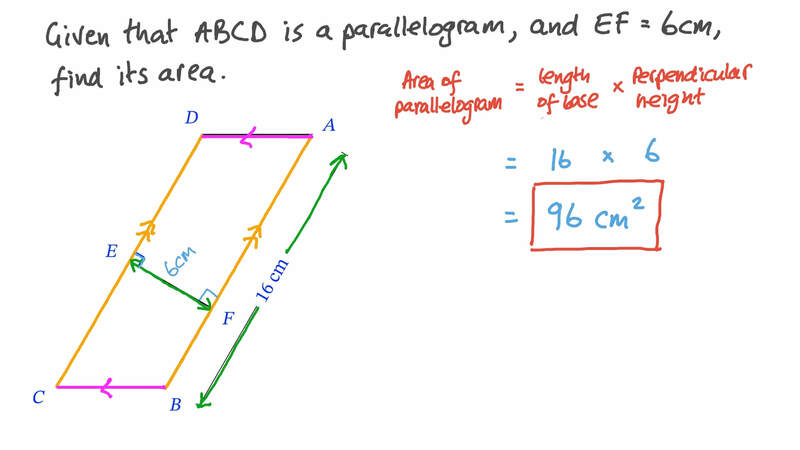 Find the area of the parallelogram , given that cm. Fares is doing a research project on the nation of Trinidad and Tobago. Part of the project is to paint a replica of the nation’s flag. Determine the area of the black part of the flag. Determine the area of the coloured part in the shown rectangle that has a parallelogram inside of it. In this wallpaper design, what is the area of the shaded parallelograms? A town requires each parking space to have a minimum area of 169 square feet. Do the measurements of the parking spaces shown meet the requirements? State the area of each parking space. Each parallelogram-shaped piece in the quilt block shown has height 1 2 3 4 inches and base 2 5 1 2 inches. How many square feet of fabric is required for 16 blocks ? Given that 𝐴 𝐵 𝐶 𝐷 is a parallelogram whose area is 2,643.21 cm2 and 𝐵 𝐶 = 6 8 . 3 c m , find the length of 𝐴 𝐸 . Given that 𝐴 𝐵 𝐶 𝐷 is a parallelogram of area 61.1 cm2, 𝑋 𝐵 𝑌 𝐷 is a rectangle of area 46.06 cm2, and 𝐴 𝑋 = 1 . 6 c m , find the perimeter of the rectangle 𝑋 𝐵 𝑌 𝐷 .